EZ SV Tissue/Tail Genotyping PCR Kit is the second generation of EZ Fast Tissue/Tail PCR Genotyping Kit which is designed for rapid small volume extraction and amplification of genomic DNA from mouse tail/toe/ear punch and animal tissues. With automated one-solution extraction, extraction of genomic DNA from animal tissue is as easy as pushing a start button. No termination buffer is needed. There is no need for overnight digestion, Phenol/Chloroform extraction and laborious DNA purification. Neither there is requirement for use of expensive DNA spin columns. Most importantly of all, the consistent result from EZ SV Genotyping Kit is unmatched by any other DNA extraction-based genotyping methods available in the market! The kit includes Tissue Lysis Solution A and B and 2X PCR Ready Master Mix III. The 2x PCR Ready Master Mix III containing Taq polymerase and dNTPs is specially optimized for use with the extracted DNA. It also contains an inert red dye that allows direct loading of PCR products onto agarose gels without addition of loading dye. Consistency is one of the important factors in choosing a genotyping method. Due to unoptimized genotyping conditions for many commercial and home-made methods or protocols, the PCR analysis sometimes give weak and/or ambiguous bands. Either, one has to repeat the experiment. Or worse, one misreads the data and carries out downstream experiments. In either case, days or months of time and efforts are wasted. Like the EZ Fast Tissue/Tail PCR Genotyping Kit, EZ SV Tissue/Tail PCR genotyping gives much stronger signals from PCR reactions and offers no ambiguous results. Consistency in results will save time and effort in a long run. DNA was extracted from six mouse tails and PCR amplification of the three target genes was carried out using the EZ SV Tissue/Tail PCR Genotyping Kit. 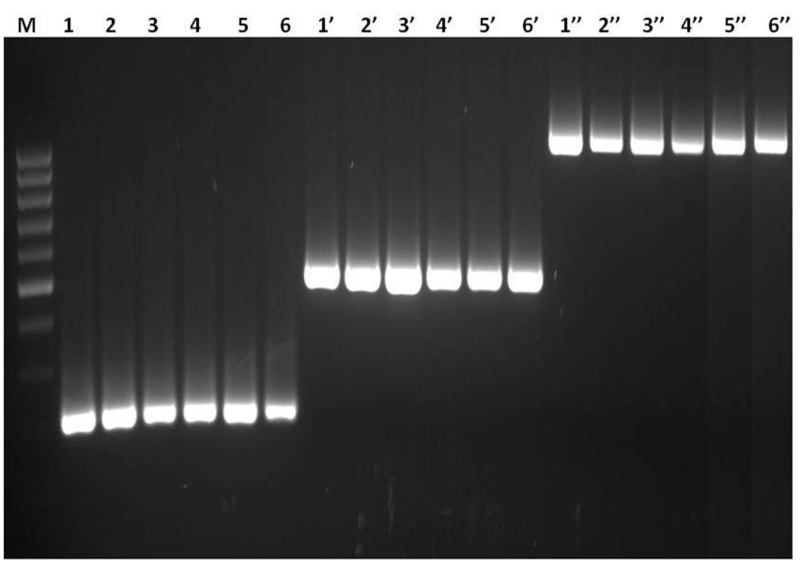 The three amplified DNA fragments (220 bp in lanes 1-6, 498 bp in lanes 1'-6' and 983 bp in lanes 1"-6") were analyzed on a 2% agarose gel. M: 100 bp DNA Even Ladder.